Flour. Everywhere. Broken egg shells. Everywhere. Powdered sugar. Everywhere. Earlier this year I told my husband that for Christmas I wanted one of those fancy motion-sensor vacuum cleaners. Forget the little blue boxes at Tiffany & Co. Forget the new Prada handbag. Bring on the hoover baby. Who in their right mind asks for a vacuum cleaner for a present? Any parent who has mistakenly kept an unopened bag of frozen peas on the bottom shelf of the freezer. Any parent who has made the same mistake, but with rice. And don’t even get me started on the amount of oatmeal that has fallen victim to construction site projects in my living room. It’s a messy job, keeping a child entertained indoors. Every room is exhausted in the process, including the kitchen. Aidan loves “helping” mama cook. Nothing makes him smile more than sitting on my countertop with a whisk, a small bowl, and his culinary creation. And so last Friday when the rain lashed down upon on us like a life-sized sprinkler with a defective off button, that’s exactly what we did. The culinary creation of choice? 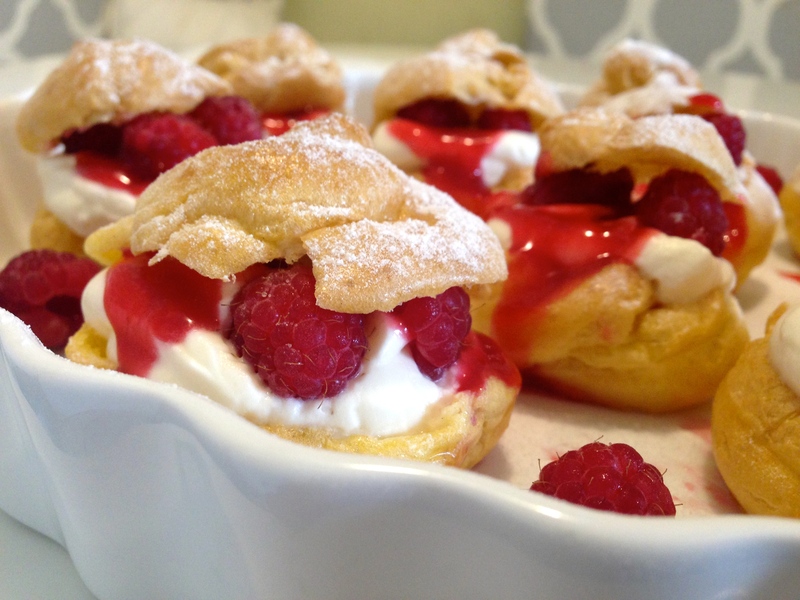 These gorgeous raspberry cream puffs… Choux pastry is a light, airy dough used to make cream puffs, profiteroles, éclairs, and other delicate delights. 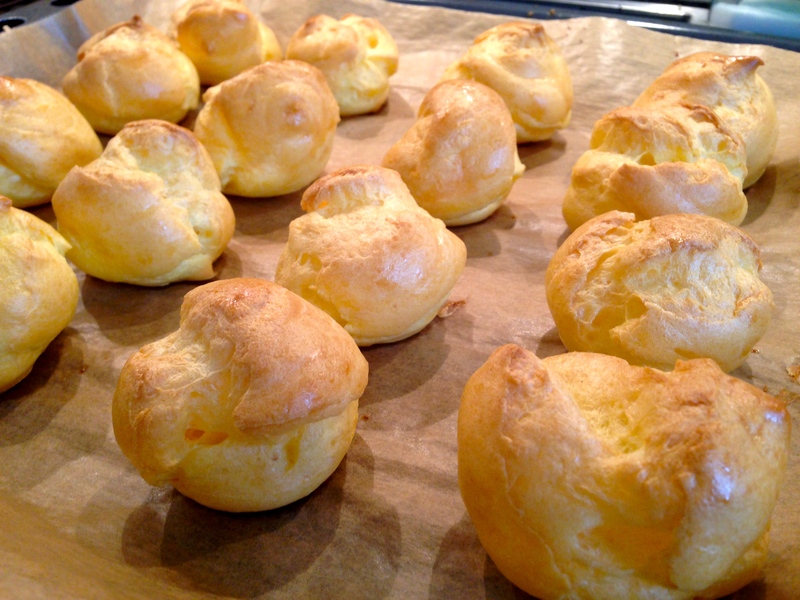 The pastry itself is made only of butter, water, flour and eggs. 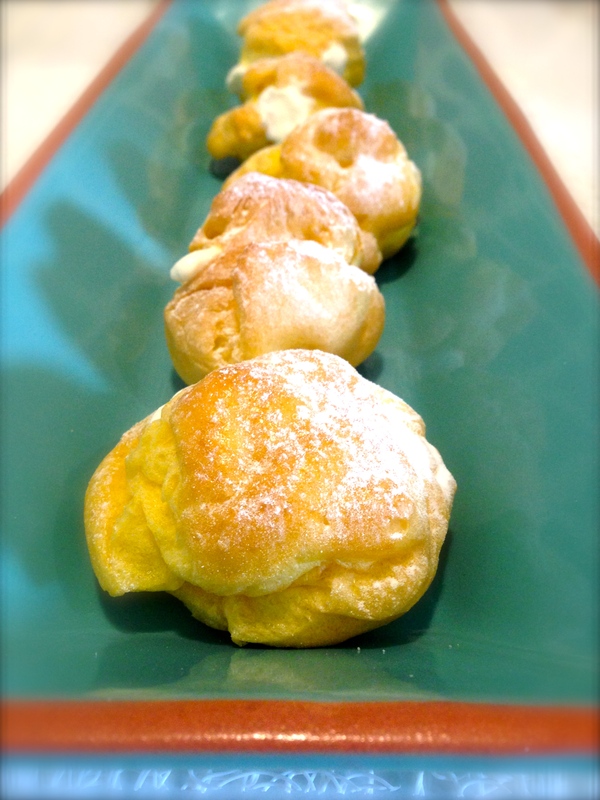 As a child, I remember my mother making these for her cream puffs. I remember watching the steam rising from her kitchen aid as she beat the heat out of the mixture. I remember the buttery scent of them baking in the oven. I remember watching them rise. 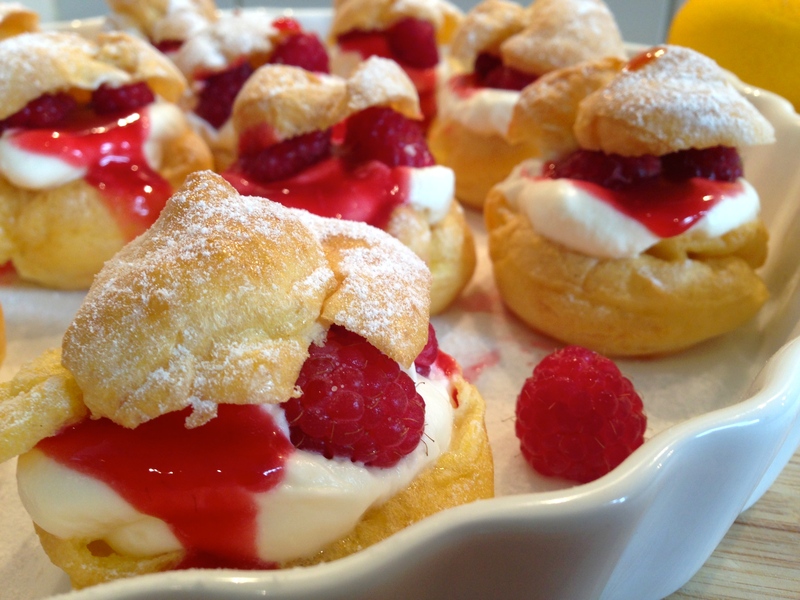 And of course, I remember salivating as I watched her fill them with her homemade custard. We are in the midst of raspberry season here in Basel, and I decided to make use of a fresh carton I had stashed in my fridge. But first up, the pastry. To make the dough, add cubed butter, salt, sugar and some water into a medium-sized sauce pan. If relegating this task to your toddler, be sure you monitor how many cubes actually go into the pan. Take it from me, it’s pretty difficult to gage the amount of butter that needs to be replaced after you discover several unknown quantities in said mouth. “It’s just a little, mama,” Aidan mouthed, barely audible, cheeks full. Anyhow, once you’ve reclaimed all your butter and it is safely in the pan, bring it to a boil, remove from heat and add a cup of flour. Just dump the whole lot in. Using a wooden spoon, cook and stir the mixture over medium heat until it pulls from the sides of the pan and leaves a film on the bottom of the pan (about 2 minutes). Transfer the mixture to the bowl of an electric mixer fitted with a paddle attachment. Mix on low speed until all the steam rises from the dough (about 1 minute). Then raise the speed to medium and add four eggs (always at room temperature), one at a time, until the dough is smooth. Now onto piping the batter. This took a bit of creativity on my part, as my piping bag had burst a few weeks before and I had yet to replace it. Ikea plastic bags did the trick. A quick snip in the corner, and viola, we were ready to go. Pipe the mixture onto a baking sheet lined with wax paper (I used two sheets) at about 1 1/2 inch in diameter, and pop in the oven at 425F (220C) for 20 minutes, until nicely browned and puffed. Turn off the heat, then quickly poke a knife into the side of each one. Apparently this helps keep them puffed. Return them to the oven with the door ajar, and let rest for 10 minutes. What you do with the rest is up to you. 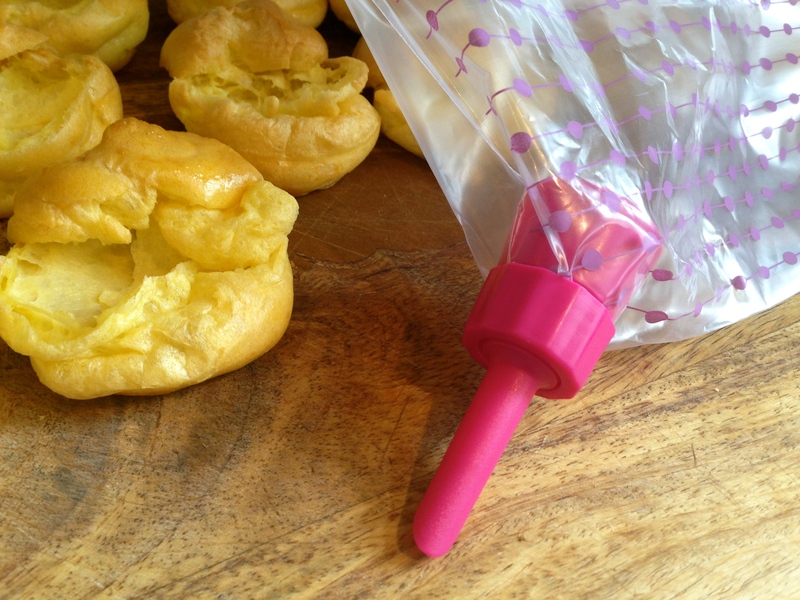 Using a serrated knife, slice the tops of each choux. Set aside. 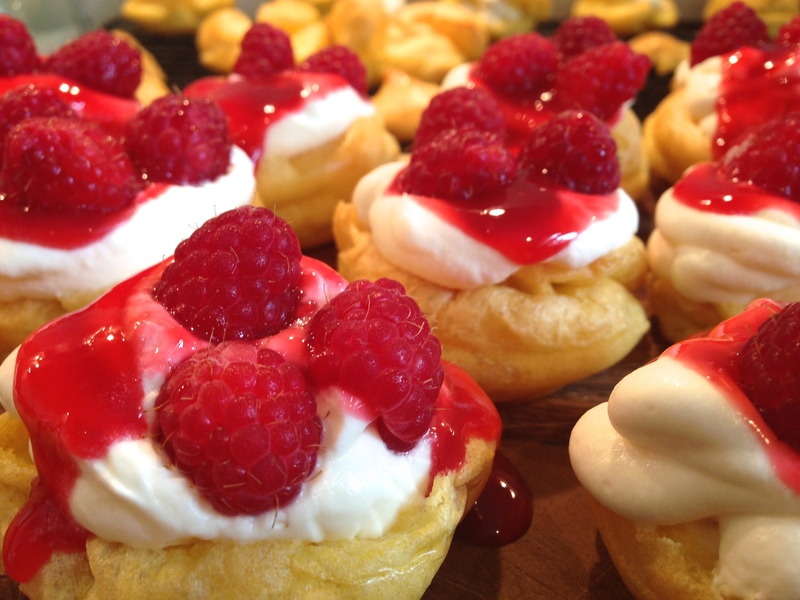 Layer bottom portion of choux with 1 dollop each of whipped cream and raspberry filling, as well as a few fresh raspberries. Gently place tops back on. Keep in fridge until ready to serve. Sprinkle with powdered sugar prior to serving. Preheat oven to 425F (220C). Line a sheet pan with parchment. Fit a large pastry bag with a large tip. Bring water, butter and salt to a boil over medium-high heat. Add flour all at once and beat with a wooden spoon until it comes together and the dough starts to coat the bottom of pan. This should take a few minutes. Dump the hot dough into a kitchen aid fitted with a paddle attachment, then mix on low speed until all the steam rises from the dough (about 1-2 minutes). Add eggs one at a time, until mixture is thick and smooth. Spoon mixture into the pastry bag, and pipe out 1 1/2 inch mounds (this recipe makes about 30). With a wet finger press each top down slightly to keep the top levelled. 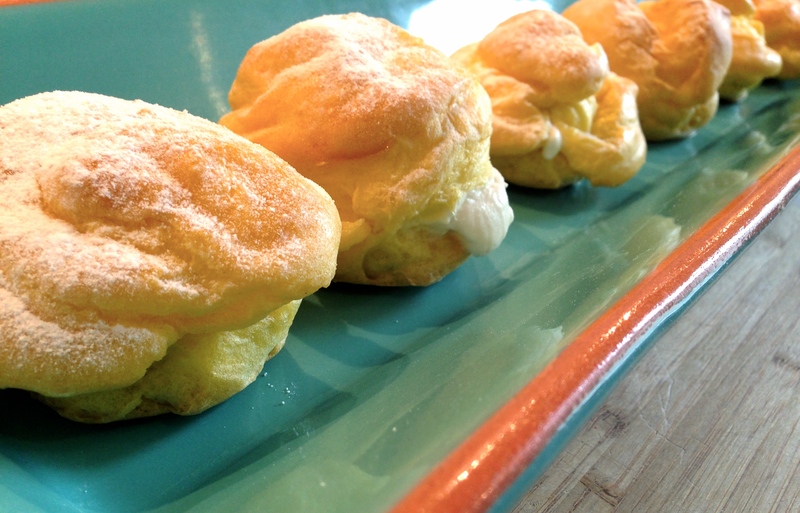 Brush with egg wash, then bake 20 minutes until lightly browned and hollow when tapped. 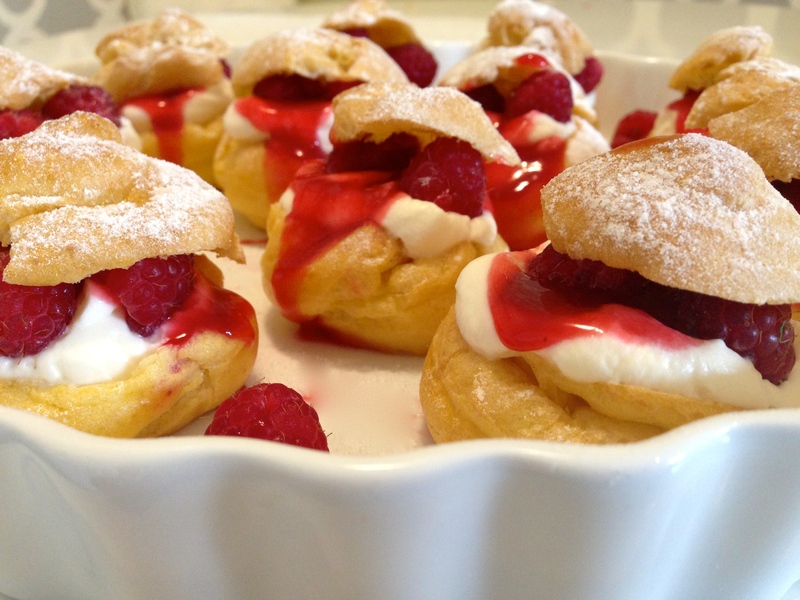 Turn off oven, make a small slit in the side of each puff to allow steam to escape. This will help them to stay puffed. Keep in oven with the door ajar for 10 minutes, then cool on rack. 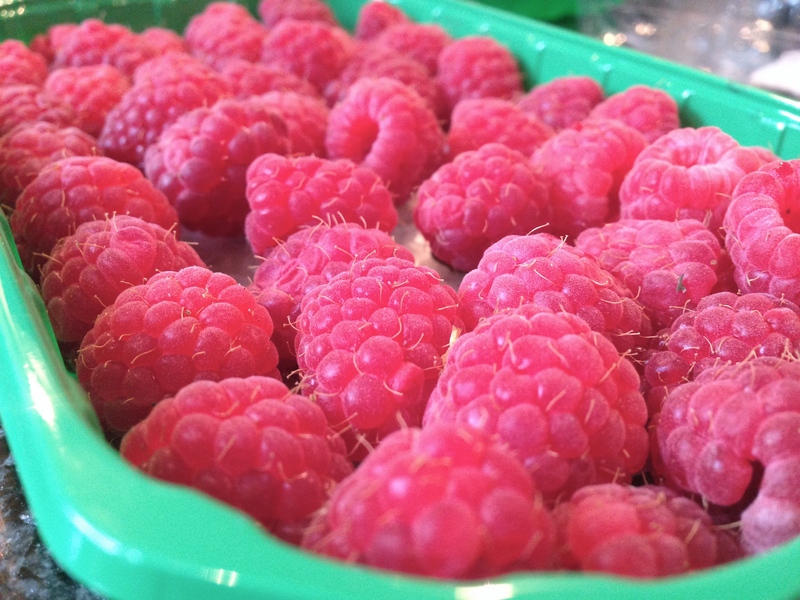 In a small saucepan, combine the raspberries, water and sugar. 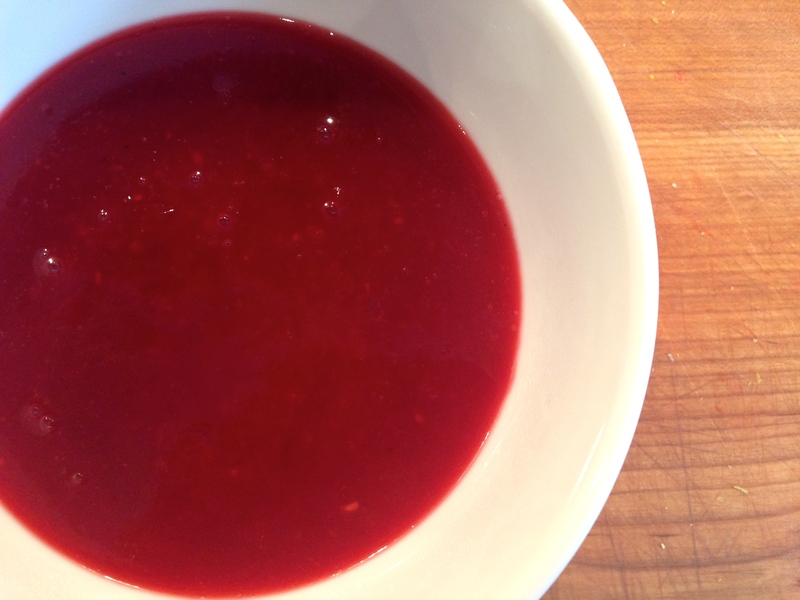 Bring to a boil, then simmer for 15 minutes until raspberries have broken down. Add lemon. Turn off heat, strain mixture in a fine-mesh sieve, then return the strained mixture to the heat. 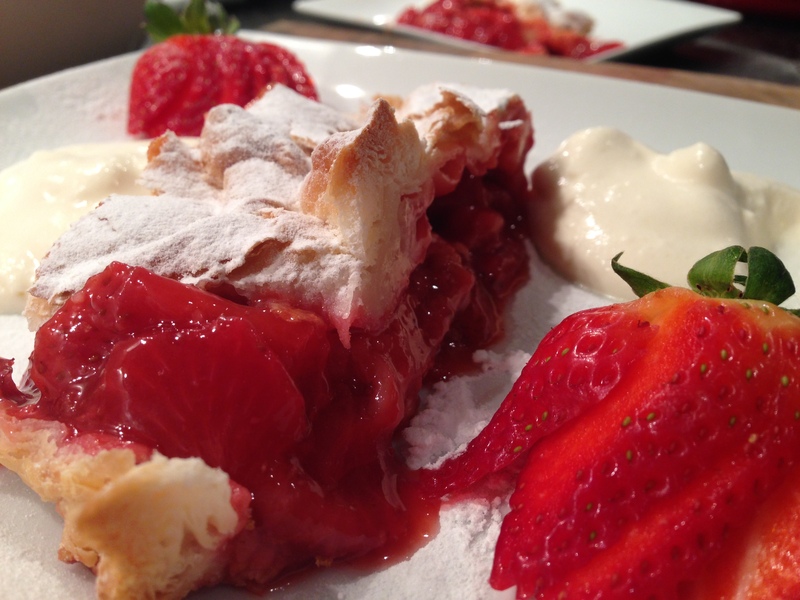 Mix cornstarch in 1 tablespoon of water, then whisk into the raspberry mixture. Bring the mixture back to a boil and simmer for a few more minutes. Remove from heat and cool completely. 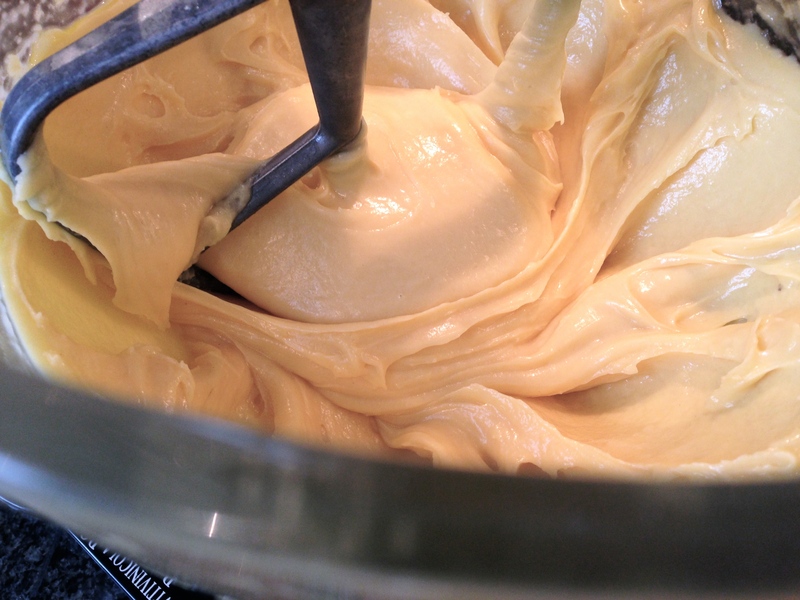 In electric bowl (or hand mixer) with whisk attachment, beat cream, sugar and vanilla on medium-high speed until cream peaks.